This highly anticipated third edition of the Handbook of Parenting brings together an array of field-leading experts who have worked in different ways toward understanding the many diverse aspects of parenting. Contributors to the Handbook look to the most recent research and thinking to shed light on topics every parent, professional, and policymaker wonders about. Parenting is a perennially "hot" topic. After all, everyone who has ever lived has been parented, and the vast majority of people become parents themselves. No wonder bookstores house shelves of "how-to" parenting books, and magazine racks in pharmacies and airports overflow with periodicals that feature parenting advice. However, almost none of these is evidence-based. The Handbook of Parenting is. Period. Each chapter has been written to be read and absorbed in a single sitting, and includes historical considerations of the topic, a discussion of central issues and theory, a review of classical and modern research, and forecasts of future directions of theory and research. Together, the five volumes in the Handbook cover Children and Parenting, the Biology and Ecology of Parenting, Being and Becoming a Parent, Social Conditions and Applied Parenting, and the Practice of Parenting. 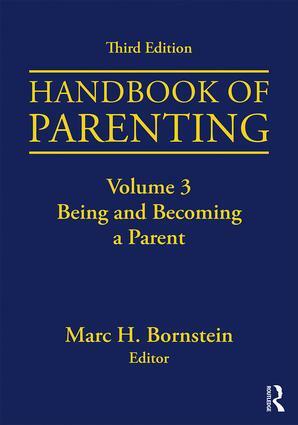 Volume 3, Being and Becoming a Parent, considers a large cast of characters responsible for parenting, each with her or his own customs and agenda, and examines what the psychological characteristics and social interests of those individuals reveal about what parenting is. Chapters in Part I, on The Parent, show just how rich and multifaceted is the constellation of children’s caregivers. Considered first are family systems and then successively mothers and fathers, coparenting and gatekeeping between parents, adolescent parenting, grandparenting, and single parenthood, divorced and remarried parenting, lesbian and gay parents and, finally, sibling caregivers and nonparental caregiving. Parenting also draws on transient and enduring physical, personality, and intellectual characteristics of the individual. The chapters in Part II, on Becoming and Being a Parent, consider the intergenerational transmission of parenting, parenting and contemporary reproductive technologies, the transition to parenthood, and stages of parental development, and then chapters turn to parents' well-being, emotions, self-efficacy, cognitions, and attributions as well as socialization, personality in parenting, and psychoanalytic theory. These features of parents serve many functions: they generate and shape parental practices, mediate the effectiveness of parenting, and help to organize parenting.